Just registered today, but have been looking over the forums (especially networking) for easily the past 3-4 months. My wife and I just bought our first home about 6 weeks ago and I'm getting around to determining a bit more of how to proceed with wireless networking in the house. Like many before me on here, I'm debating between Unifi and Open-Mesh. I have read and heard pros and cons to both (which I'll list below, and hopefully will set off some good healthy debates for me to ultimately become more informed), but am still undecided. Would all of you be willing to help out!? 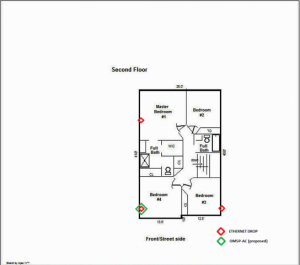 The house is roughly 2100 sq ft, split fairly evenly across 2 floors. I have attached rough floor plans from the appraisal. The house was built in 2009 and is all standard drywall, with an unfinished basement (which would take it to 3 total floors and roughly 3200 sq ft when finished). If needed, I could run some more ethernet under the first floor to a panel on the first floor, but I'd rather not. On the floor plans, I have marked with red diamonds where cat5e is already in place. I currently have 300/100 for speed, but most likely will be upgrading to 1000/400. I am already using a Ubiquiti ERLite-3 as my router. I wanted to get away from a standard router, but was somewhat limited as I had to know for a fact that TDS fiber TV and internet would work (especially the TV). I found a great walkthru of how to configure the ERLite-3 to work with TDS TV (it's a bit wonky) and I have a sysadmin coworker who uses a great deal of Ubiquiti products at a private school he volunteers at as the IT professional/network administrator. He highly recommended Ubiquiti, especially the current round of AP's as well as routers. Now I know many on here have had issues with the Unifi APs but, I have also begun to read that the new Unifi AP-AC-Pro is a great AP and very few have had any issues at all with it. This is especially true when compared to the prior generation of APs that I have deciphered many on here have had issues with. My coworker has about 15 of them deployed at the school and has had no issues with them at all since launch. I'm hesitant about the Unifi because install will be bit more work and I'd like as easy and clean as an install as possible, that's why I've also been considering Open-mesh. Here's my breakdown--I'm open to other hardware as well from the 2. Would OM5P-AC struggle with the proposed locations? 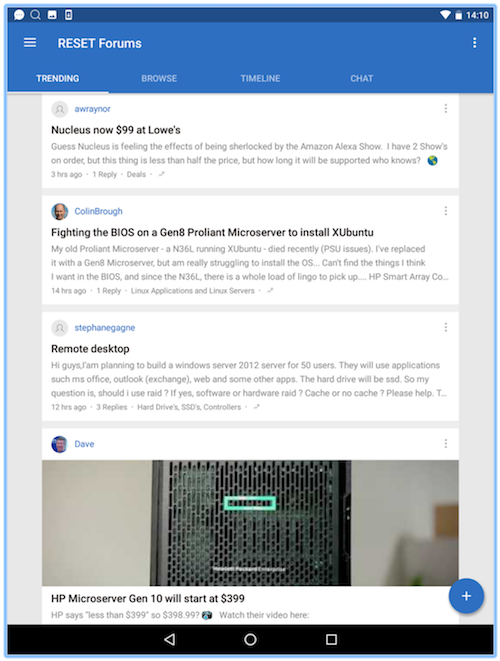 -Locally hosted controller. Can still fully configure if Unifi goes under or WAN is down. -reputation issue in older models. Any help, guidance, or opinion is greatly appreciate as many of you have used one of these extensively, if not both. Thanks in advance! 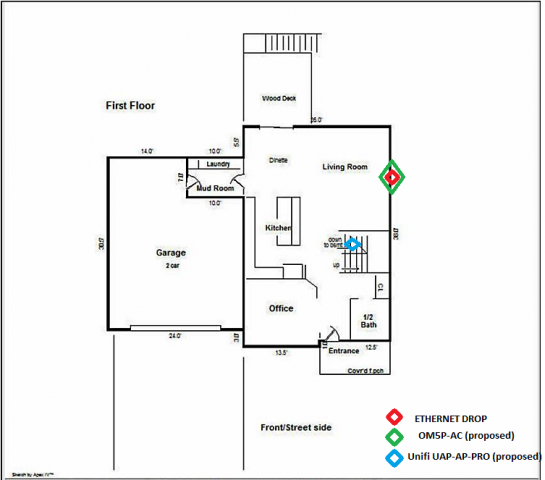 Can you mount the Unifi AP-AC-Pro in the center of the house? First floor ceiling between the Kitchen and the stairs? If so I think you can cover the entire home with one AP. Where does your Internet terminate? Where do you think you will have the heaviest WiFi usage? Avoid the square AC model - they have a bad reputation. Personally, I would run a wire to each AP, no matter what make you choose. If you don't use cable for backhaul, you use up a radio, and therefore will cut the effective speed/throughput. What band are your clients? Mostly 2.4ghz, you can use fewer APs in a central location. If you are mostly 5ghz, better to use more APs and turn the TX power down as 5ghz doesn't penetrate walls/floors as well as 2.4ghz. You could also consider the Ubiquiti AC-LR. This is the long range model (again, get the new not the old) and has better optimised antenna. Turn down TX and they work very well in residential. 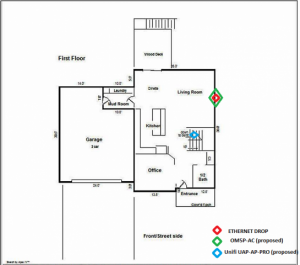 I thought about using the Unifi in the center of the house on the first floor, except it won't get the wife approval factor out in the open between the kitchen and the stairs. I was thinking of placing it just inside the stairwell going down to the basement and mount it on the ceiling since that entire stairwell is dry walled. Only worry is that the AP is immediately walled in. This is marked on the first floor plan. Internet terminates in the basement under the mudroom. No way to change any of that as the ONT is on the backside of the house there w/cat5 running in at that location. All cat5 and coax (I use MOCA 2.0 adapters for the TDS TV boxes) then runs up through one conduit there and splits off throughout the house. I have the router, 2 switches, 1 MOCA adaptor and MOCA coax splitter all down there. Would also have my POE injector down there once I determine APs. As long as the stairwell is wood and sheetrock it should not block much of the signal. My house is a two story four bedroom with a basement. I had a single AP (EnGenius EAP600) on the top floor in the middle and coverage was good through the house. That AP had a broadcast pattern the was mainly down and out. I have gone to a different AP (EnGenius EAP1200) that is more of a 360 degree broadcast pattern. I installed the new AP in the basement stairwell on the first floor, middle of house. Coverage is very good. I have seamless steel siding so not much WiFi gets outside, but by moving the AP to its new location the glass patio door is 12 feet away and outdoor WiFi at least covers the deck. If I need better coverage up stairs I will put a second AP back on the top floor, previous location of my first AP and run two. If needed could you run a second AP upstairs? I very well could put a 2nd AP upstairs if need be. 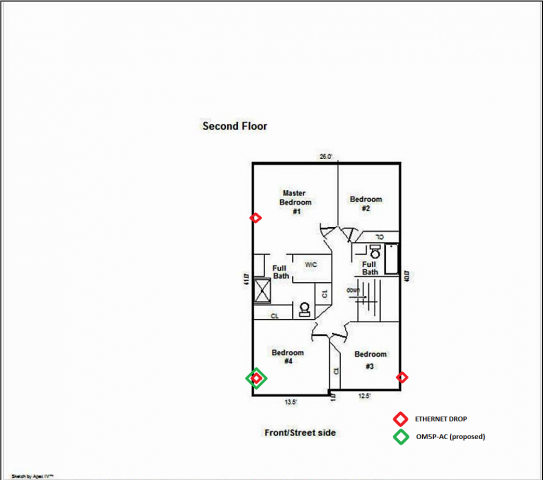 The Unifi would very much cover the first floor no doubt, but finding a location on the 2nd floor would be more troublesome as there is no additional cat5e run up to the attic (at least to my knowledge) to split out and drill down into the linen closet at the top of the stairs (labeled CL). That was one of the pluses for the Open Mesh products: I could essentially place them anywhere I had a cat5 wallplate and still pass thru, I'm just unsure of the range of the OM5P-AC. That's one of the things I'm hoping someone here can answer for me since I know there is a LOT of love for OM compared to Unifi here at HSS. O-M definitely makes it easy to scale. They are only 802.11b/g/n, 2.4Ghz and the ports are only 10/100, but for $60 each they could be a nice fix if you run into WiFi coverage issues. Does the controller treat these AP as the same network? These AP are different technology, will I get seamless hand-off? From my own experience, I think one WAP will give you the coverage you need. I'm assuming your mean one of the Unifi AP's? I would get these in a heartbeat if they were 10/100/1000 and had 802.11ac, but the mind boggling lack of both of these prevents that. With having 300/100 internet speeds, I don't want those guys to be the bottleneck. You would most likely not need them, but the UAP-IW would just be for coverage if you had dead spots. Your 300Mb/100Mb Internet service is shared between all of your devices. Streaming a 4k movie from Netflix uses about 15Mb. Theoretically, you could have two or three 4k movies streaming to different devices on the UAP-IW. That said I still believe one UAP-AC-Pro will cover your home, if not I would add a second UAP-AC-Pro. I believe O-M has improved throughput, but even if it is still in the 150Mb range, multiple devices on different O-M AP's should not have any issues. Yo, O-M fan boys! Jump in anytime here! Your 300Mb/100Mb Internet service is shared between all of your devices. Streaming a 4k movie from Netflix uses about 15Mb. Theoretically, you could have two or three 4k movies streaming to different devices on the UAP-IW. I'm well aware it's shared. I'm really just not a fan of it being the limiting factor, especially for all the devices hardwired to each port. The drop in the living room has a 5 port switch connected to it, which is maxed out; the drop in bedroom 4 has an 8 port switch connected to it, which is nearly filled. The big thing is if I'm downloading or uploading files to my online backup, I want full capacity. Also want to make sure that transferring files locally around my network from server to MacBook Pro or other way around, that there's very little bottleneck. I have 4 different TVs with Kodi clients that tie back to Plex Server. Any movie playback over the local network is done as a direct play with no transcoding, so any one stream can be as high as 45 mbps. If I have any other hard-wired activity, I could potentially have issue, especially in bedroom 4 where the server and storage is and more data needing to be server across the network from that point. Hopefully with ethernet backhaul on all the OM AP's, I shouldn't see too much drop. No kidding! Where is everyone!?! I'm looking for some great discussion, debate and advice here!